This week on the blog, meet the Authors Out of Carolina—four amazing North Carolina writers who have come together to support each other and bring their new releases into the world. Erika Marks, one of the Fabulous Four, was kind enough to give me a behind-the-scenes glimpse into how this innovative collaboration came to life. Q: Who are the Authors Out of Carolina, and how did the group come to be? A: Hi, Emily—and thank you so much for having me visit today! 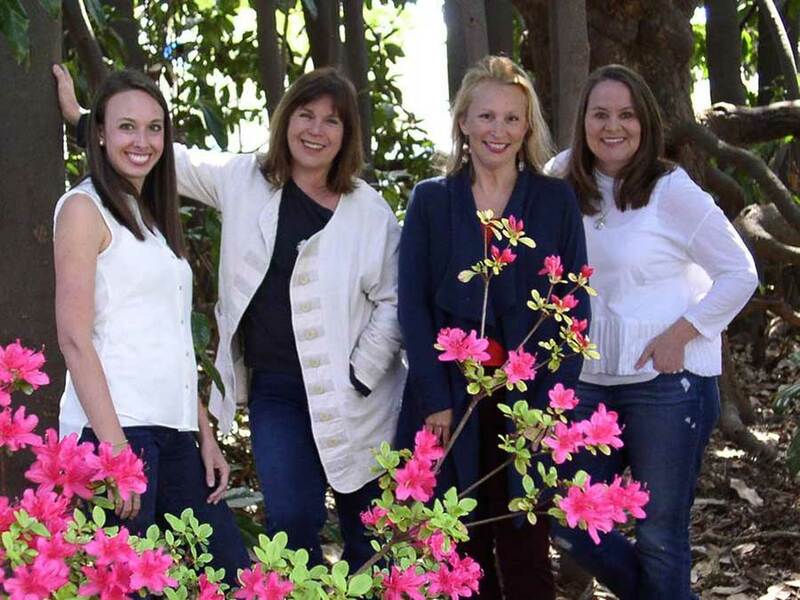 Authors Out of Carolina is a collective of four Charlotte writers: myself, Kim Wright, Marybeth Mayhew Whalen, and Joy Callaway. While we’ve all been friends for a while, meeting regularly at local cafes to talk shop, it wasn’t until we realized that we were all launching novels at the same time that we developed the idea of an author collective to pool our resources, not only for a group launch event, but also to tour and visit book clubs together. Q: Tell us a little bit about the books that the four of you have coming out this summer . . . what are they all about? Are there stylistic or thematic connections between them that make this collaboration especially exciting? A: Love to! My novel, THE LAST TREASURE, is a present-day love story set in Wilmington and the Outer Banks, featuring a love triangle of treasure hunters, and the real-life mystery of the schooner that was carrying Aaron Burr’s daughter Theodosia in 1813 and disappeared off the Carolina coast without a trace. Pitched by its publisher as Edith Wharton-meets-Little Women, Joy’s THE FIFTH AVENUE ARTISTS SOCIETY is about a family of four artistic sisters living in genteel poverty on the outskirts of Gilded Age New York high society and centered on the oldest — an aspiring writer caught between the boy next door and a mysterious novelist who inducts her into Manhattan’s most elite artistic salon which has a seedy underbelly and secrets to hide. Kim’s novel, LAST RIDE TO GRACELAND, traces the journey of Cory Ainsworth, a down on her luck blues singer who, based on the fact her mother was once a back up dancer for The King, has always fantasized that her real father was Elvis; when Cory finds the car Elvis drove on the last day of his life hidden in her family’s fishing shed, she decides to drive or back to Graceland, looking for answers along the way. In an idyllic small-town neighborhood, a near tragedy triggers a series of dark revelations in Marybeth’s novel, THE THINGS WE WISH WERE TRUE. During the course of a sweltering summer, long-buried secrets are revealed, and the neighbors learn that it’s impossible to really know those closest to us. But is it impossible to love and forgive them? While the storylines of our four novels are very different, they do share some common themes, such as strong female characters on a search for self, the dynamics within families and communities, and how the past can frame one’s sense of identity and how revisiting the past can sometimes be both a gift and a danger. We’re excited to explore all of these themes—and many more—with readers and writers on our travels. Q: How does the collaboration work? Can you tell us how you’ve combined resources on and offline to spread the word about your fantastic new releases? A: One of the reasons the collaboration made great sense for us was that each of us brings a different set of skills/reach to the table. One of us has a marketing background, another has a graphic design background, so we’re able to make effective promotional materials. Some of us have very strong ties to local book clubs and library contacts. Another of us has contacts from local news/media outlets, so we are able to spread the word across lots of platforms and in diverse communities. There’s also the financial piece: If you’re not being funded by your publisher, the costs of touring and promotion can get very expensive. For example, we were able to pool our money to reserve a great space for our group launch that divided by four was manageable but would have been challenging for each of us on our own. Also, we bring different readers to the table as well. 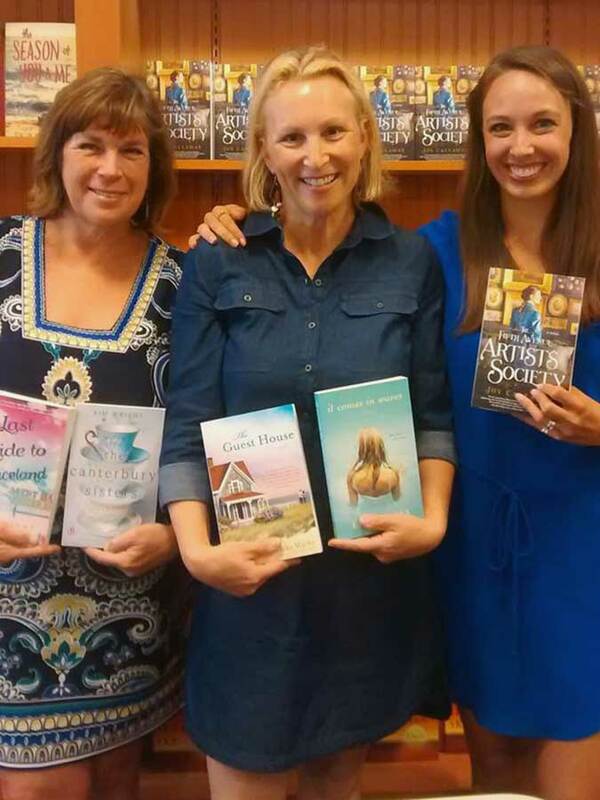 How exciting that some of my readers will be introduced to Joy, Kim, and Marybeth—and vice-versa! We hope too that bookstores will benefit with the group format too, in that we can potentially bring in four times the readers for our events! Q: Do you think joining forces like this is especially valuable in today’s publishing world? In your opinion, what are the advantages? Any drawbacks? A: I think one of the things that we are most excited about in this venture is that it feels very experimental. Let’s face it: Being an author is truly a business, now more than ever, and writers are constantly trying to find new ways to reach readers. 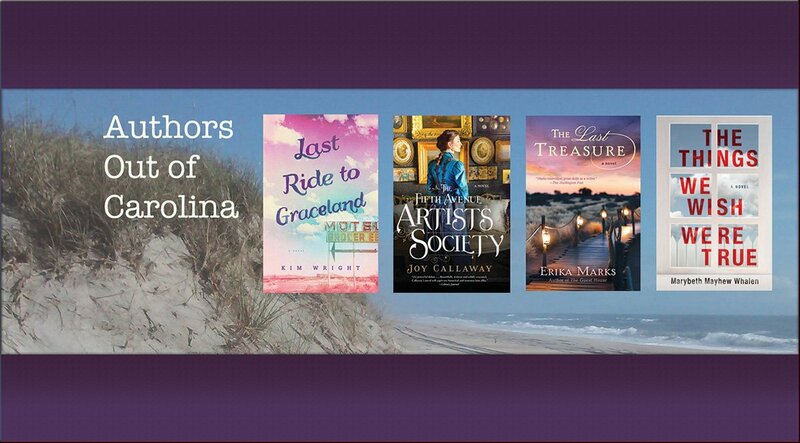 While Authors Out of Carolina is looking forward to pooling our financial resources for these tours—travel expenses, advertising costs, etc.—there’s a pooling of emotional resources that I think is equally as appealing. As you know well, Emily, promotion and touring can often feel isolating when you are an author on the road alone. Touring together, being invested together, we believe will provide a wonderful source of support to one another as we navigate the winding road of book promotion. As far as drawbacks, we haven’t found any yet—but I will say that I think it’s important that if you plan to do something like this with a group of authors, that you feel comfortable with one another, and that you are clear about your dynamics and roles. We four were already good friends—but I have no doubt that a group could form and thrive in any configuration, so long as the communication and investment are strong. Q: What’s the best part of being a member of the AOOC? What’s taken you by surprise? A: There’s no question that for me the best part of the collaboration is the support—knowing we have each other’s backs, and that we can understand and share the ups and downs of this journey. What’s been most surprising—though maybe shouldn’t be—is the great response we’ve gotten to the concept from both writers and readers. It makes me wish we’d formed our group sooner—but we are all hopeful that the model has appeal—and success!—and that maybe it will take off with other authors looking to pool their resources and books in a group effort! Q: How can folks find out whether the Fabulous Four will be coming to a location near them anytime soon? A: Fabulous Four—I love that! We are in the process of posting events to our Facebook page, but in the meantime, you can find our tour schedule on all of our individual websites. Q: What didn’t I ask that I should have? 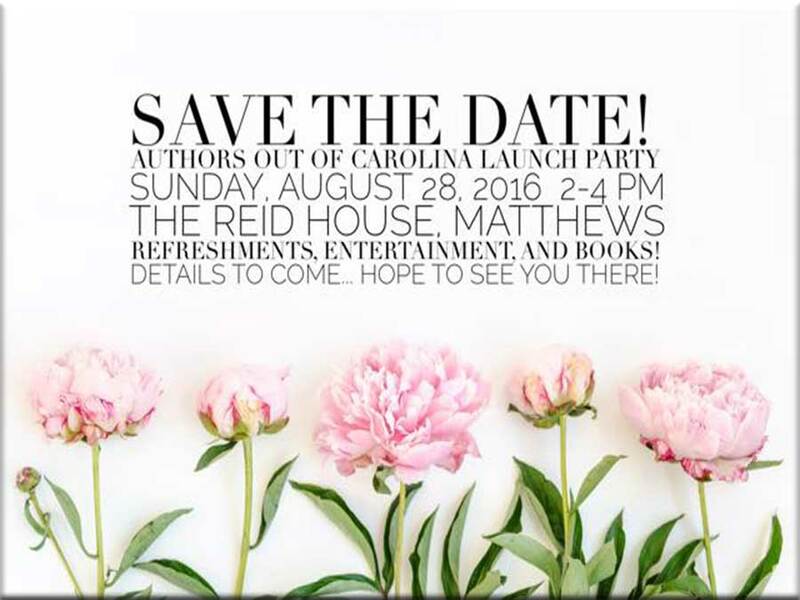 What would you like the world to know about Authors out of Carolina? A: Your questions were fabulous, Emily! We just want the world to know how much we’re looking forward to hitting the road together, and to connecting with readers—and writers—who love storytelling as much as we do. We can’t wait to meet you all and share stories! Erika Marks has worked as a carpenter, an illustrator, an art director for a woodworking magazine, and a cake decorator. A native New Englander, raised in Maine, she now lives and writes love stories set by the sea in North Carolina. Her newest, THE LAST TREASURE, comes ashore August 2, 2016.